Like most people I love to drink wine, but trying to remember all of your favorites is a nightmare. Luckily Vivino Wine Scanner for the iPhone is here to the rescue. My parents are in a wine club and got me signed up for it as well. They ship you a case of wine every few months. They send you literature on the different wines, but honestly who really goes back and reads that stuff? With Vivino Wine Scanner you can dramatically change your wine drinking experience. Vivino Wine Scanner has a database of over 500,000 wines and it is so advanced that all you have to do is take a picture of the bottle and it will automatically match it for you. If for some reason the wine is not listed in their database, they have a staff of experts who will match it for you. Now you can easily remember all your wines and learn more about them. Vivino Wine Scanner allows you to create a free account to backup and share your favorite wine list with friends. You even get access to user-generated content to see info like ratings and tips. You can even follow your friends to see what wines they are drinking and their thoughts and reviews. Not only that but you can have the application check out nearby locations to see what types of wine are available based on your location. Having access to all the different bottles of wine right from your iPhone is super handy when going out to eat. 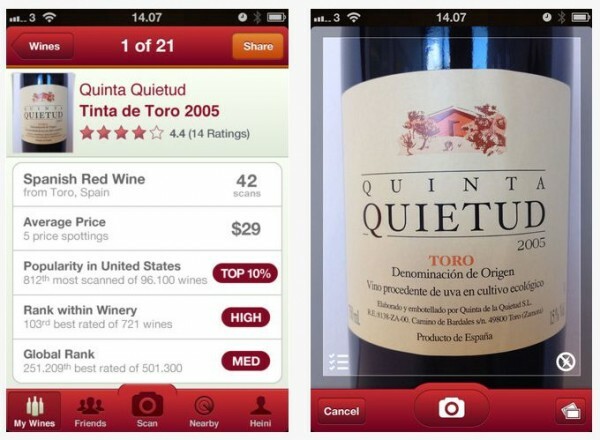 Vivino Wine Scanner is the perfect take a long application. It is available on the Apple App Store for the low price of FREE. If you enjoy drinking wine this app is a must to check out!